Greenwich Instant Deals ~ Philippine Freebies, Promos, Contests and MORE! Greenwich is yet again giving their customers a chance to get awesome prizes in their latest promo. 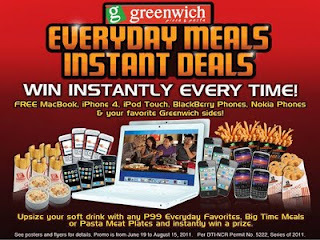 Eat Greenwich everyday meals to get instant deals from June 19 to August 15, 2011 from store opening until 2PM. Visit your favorite Greenwich outlet and upsize your soft drink with any P99 Everyday Favorites, Big Time Meals or Pasta Meat Plates to a scratch card fora chance to win instant prizes like MacBook, iPhone 4, Blackberry Phones, iPad Touch, Nokia Phones and your favorite Greenwich sides.